“We entered the single-cell field with a homemade microfluidic capture platform, but there was a lot of variability between runs. We then started using the Dolomite Bio Nadia and Nadia Innovate, and were able to generate much higher quality and more consistent results. However, some of the cell types we are interested in have projections up to a meter long and are impossible to get into sub-millimeter droplets, so we started running the sNuc-Seq protocol, because nuclei are more uniformly sized, easy to extract, and are fairly robust for archiving. 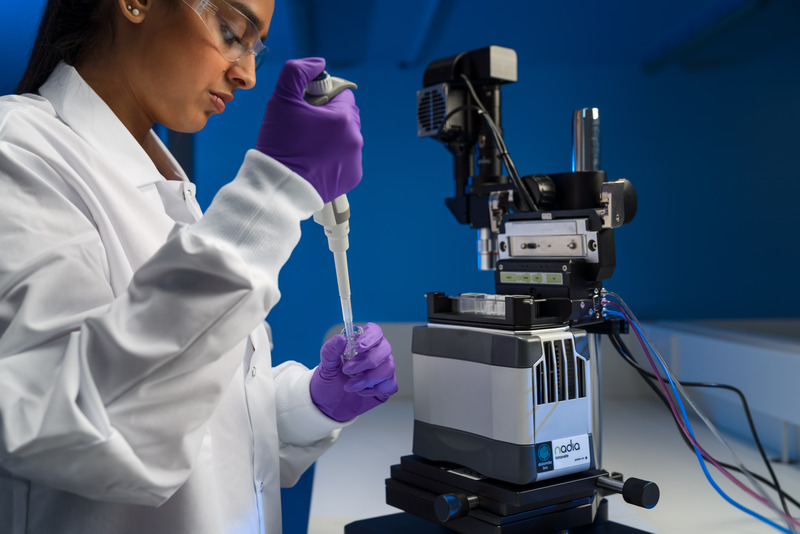 “The Nadia Innovate is intuitive and easy to use, and its versatility has allowed us to optimise parameters to reduce droplet volumes, increase capture rates and concentrate the RNA, giving a better insight of gene expression in each cell. Additionally, the ability to multiplex on the platform gives us the choice to run up to eight chips in parallel, which reduces the variables in our workflow, and massively increases our throughput. sNuc-Seq has allowed us to detect gene expression changes in different cell types in motor neurone disease, and has accelerated our research in a short space of time. It has really opened up a whole new dimension to our research,” Dr Sibley concluded.